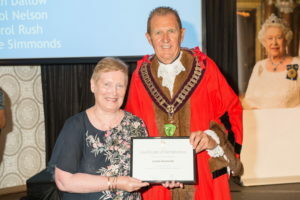 On Australia day, we were very proud to see our President, Carole Simmonds receive her Australia Day nomination award from the Mayor, Kevin Knight. Carole was one of 13 volunteers nominated by community groups and sporting clubs for the Council’s Outstanding Citizen of the Year award for 2018. They had all done amazing work in our community and how the judges chose a winner, I don’t know. Nevertheless, we are very proud of Carole and grateful for all the hard work she puts into preserving, protecting and promoting our local history and has done now for 16 years as President.